On 29th December 1962 we beat Sheffield Wednesday 4-0 at Turf Moor. It was one of only two First Division games to beat the weather, West Ham winning 4-3 at Nottingham Forest in the other. 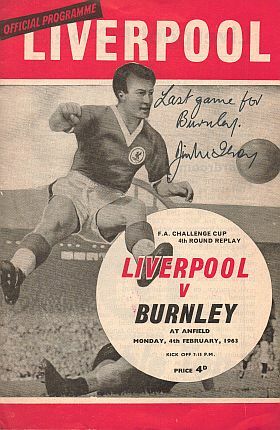 We'd lost the previous game 3-1 at Everton two weeks earlier when significantly the Burnley goalscorer was one Jimmy McIlroy. Game after game was called off but we did get in three FA Cup ties. The 3rd round tie, a 3-0 win at Spurs, was played on a Wednesday afternoon on a snow covered White Hart Lane pitch. Ten days later a John Connelly equaliser gave us a 1-1 draw at home in the 4th round against Liverpool. It took another 25 days before the replay could be played. It was postponed five times but at the sixth time of asking was given the go ahead on Wednesday 20th February. When Burnley won that last league game it meant we were in third place going into the new year. Liverpool were five points behind us in 5th but they'd started to put a good run together. We'd beaten them at Anfield in November but they hadn't lost since and that continued up to the day of the replay. In the week leading up to the game they'd been able to play two league games whilst we continued to gather rust through inactivity. To show the sort of form they were in, they'd beaten Aston Villa and Wolves, both at Anfield, 4-0 and 4-1. We had rushed through a friendly on the previous Friday. With the game against Blackpool called off we flew to Dublin and played Manchester City at Dalymount Park in a game that featured three future Burnley managers - Jimmy Adamson, Brian Miller and John Benson. Our arrival at Anfield was probably as underdogs but there was a massive following of supporters with local coach firms Bracewell's and Central Motors confirming that many of their vehicles would be making their way to Merseyside. "Liverpool favourites? I'm afraid so," said captain Jimmy Adamson. "But let me hasten to add, that's how Burnley prefer it to be. "We know we have already been written off in some quarters. They are saying that Liverpool are unbeatable and unstoppable at Anfield. That's alright with us because we have enough experience of this game to know that such talk is sheer nonsense. "We like being the underdogs because all the onus is on Liverpool. We ourselves are quietly confident that we can surprise a few people. After all, what we did at Tottenham, we can do again." The night proved to be a dramatic one. We held the lead but eventually went out to a shock penalty in the last minute of extra time, but the biggest shock wave was to come days after the game. No one at the time could have ever known that Jimmy McIlroy was playing his last game for Burnley. It was the regular Burnley team that took to the pitch. It showed just two changes from the team that had played in the final just nine months earlier. 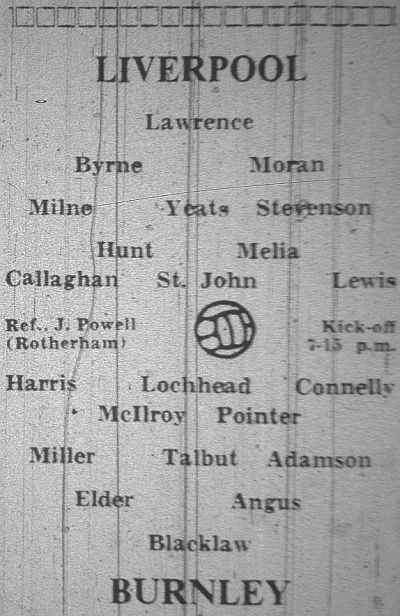 John Talbut now the regular centre half having displaced Tommy Cummings and up the pitch, Andy Lochhead had come in at centre forward with Ray Pointer moving to inside right and McIlroy taking the inside left berth in place of Jimmy Robson. Liverpool won it in the very last minute of extra time after a tragic mistake from goalkeeper Adam Blacklaw who had, up to that time, had an outstanding game. It all looked to be going to a second replay until Adam made an error clearing the ball which led to him giving away a penalty. For those not able to go to Anfield, the BBC showed some of the action live on Peter Dimmock's Sportsview programme and we saw left back Alex Elder, who had a brilliant game, give Burnley the lead midway through the first half. Adamson played a cute cross field pass to ELDER who drove in a shot from fully 35-yards. Ray Pointer tried to finish it off. 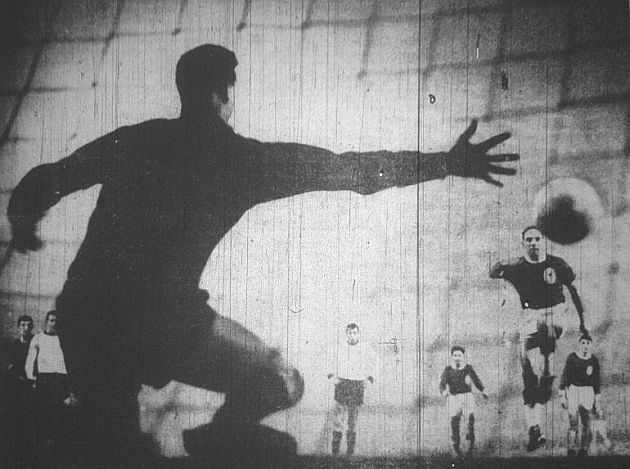 He didn't get a touch but unsighted goalkeeper Tommy Lawrence as the ball went right into the corner. Somehow we held onto the lead until just before half time when, with fifteen seconds of the half remaining, Liverpool fashioned an equaliser. It was a simple goal too as Gordon Milne provided a pass for Ian ST. JOHN who scored from close range. The second half and the first half of extra time were goalless but that was down to the brilliant defending from Burnley and the goalkeeping of Blacklaw. The second half of extra time went the same way, that was until the last minute. Elder passed the ball back to Blacklaw with the seconds ticking away. He could have chosen to do any number of things but he opted to launch the ball upfield from the edge of the box and succeeded only in scoring a direct hit on St. John who was just a couple of arms length away. Most referees at most grounds would have given Burnley a free kick but he allowed play to continue as the ball rebounded past Blacklaw. St. John had an open goal so Blacklaw dived, grabbed his feet and brought him down. 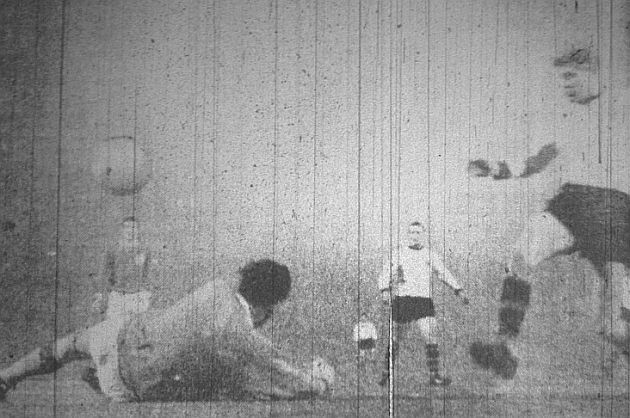 The referee had no option now and pointed to the penalty spot and, with just twenty seconds of the game to go, Ronnie MORAN scored the penalty to put Liverpool through. After a semi-final and final appearance in the previous two seasons, Burnley had gone out of the FA Cup in the 4th round. The dejected players left the pitch with no idea what would happen to our team, our club, and our best player, before we kicked another ball in anger. Is 50th FA Cup appearance and his 497th competitive appearance for Burnley was to be his last. This night at Anfield proved to be much, much more than a mere defeat in the FA Cup. Liverpool: Tommy Lawrence, Gerry Byrne, Ronnie Moran, Gordon Milne, Ron Yeats, Willie Stevenson, Ian Callaghan, Roger Hunt, Ian St. John, Jimmy Melia, Kevin Lewis. Burnley: Adam Blacklaw, John Angus, Alex Elder, Jimmy Adamson, John Talbut, Brian Miller, John Connelly, Ray Pointer, Andy Lochhead, Jimmy McIlroy, Gordon Harris. Referee: Mr J. Powell (Rotherham).